FIRST AID FOR REMOTE BATTERIES! Save, charge and maintain your 12V (Lead Acid) or 12.8V- 13.2V (Lithium – LFP/LiFePO4) battery from another 12V battery! NO AC POWER REQUIRED. Recharge your trailered motorcycle, ATV or speed boat’s battery on the way to the venue. 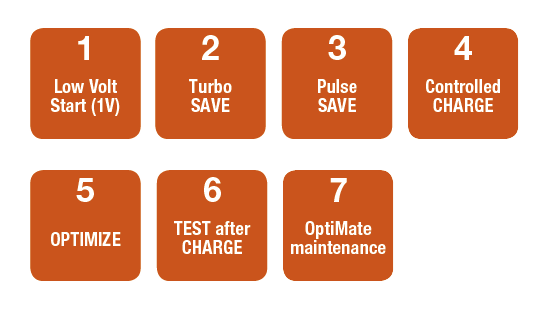 Resets the BMS (battery management system) on lithium (LiFePO4) batteries and then recharges the battery fast. Fully automatic – As easy as 1-2-3 to use. NO AC POWER REQUIRED. Use a 12V battery (on your vehicle) as the power source to recharge both 12V lead-acid and 12.8-13.2V LFP (LiFePO4) batteries. RECOVERS deep discharged batteries from ‘dead flat’ (2 Volts). Multi step charging at 2 Amps. MAINTENANCE: Efficient float charge keeps battery at full charge whilst drawing minimum power from source battery. SOURCE BATTERY PROTECTION: low battery warning light and automatic shut-down. How it works: As simple as 1-2-3! Attach the fused clip set to the short input cable (side marked 12 – 16V) and then connect the OptiMate DC to DC to a charged source battery e.g. your vehicle’s 12V battery. The OptiMate DC to DC’s SAVE and CHARGE LEDs will blink together for 1 minute, indicating it is ready to charge a battery. Within 1 minute* connect the output charge lead to the battery requiring charge, using the standard clip set or connect directly to the battery that may have the weatherproof battery lead already pre-wired. Charging proceeds when the SAVE or CHARGE LED turn full on. *After 1 minute the OptiMate DC to DC turns off if not connected to the battery that needs charging. To re-start, disconnect from the source battery and then once again reconnect. Wait until the green TEST LED blinks. ‘First Aid’ charging has been completed! Leave the charger connected for ‘365’ long term maintenance. IDEAL FOR : STD, AGM & GEL 12V batteries from 6Ah and LiFePO4 (LFP) 12.8V/13.2V batteries from 2Ah. INPUT : 12-16 V, 2.7A max. With source battery protection > low battery warning light and automatic shut-down. INCLUDED: Fused battery clip set, standard battery clip set & weatherproof battery lead. SAFE: Input electrically isolated from output. No risk of overcharging. Totally safe for vehicle electronics. Sparks suppressed. Safe for long-term battery maintenance. Automatic shut-down if short-circuited or battery disconnected. 3-year limited replacement warranty.